Actually, October has two birthstones: opal and tourmaline! 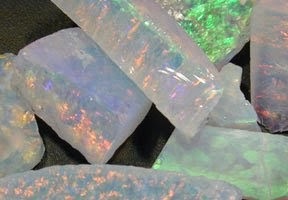 Both are so beautiful, but I want to share some info about Opals, one of my favorite gems. My favorite interesting fact about Opal: in 2008, NASA discovered Opal on Mars! Opal is a hydrated amorphous (non-crystal) form of silica (sand or quartz). "Hydrated" means with water, and Opals are usually 3% to 21% water, with most opals somewhere in the 6-10% range. It is found in fissures of rock, and 97% of the world's supply comes from Australia---it's national gemstone. 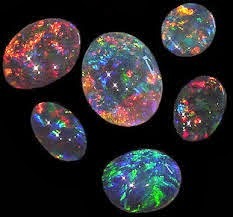 There is "Precious Opal", which is opal (as pictured left) which displays a wide range of colors. 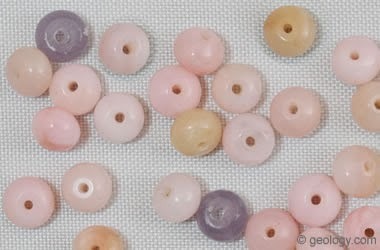 Precious opal ranges from clear through white, gray, red, orange, yellow, green, blue, magenta, rose, pink, slate, olive, brown, and black. These flashes of color are also known as "Opalescense" or "play of color". Because of this play of color, Opal was prized in the Middle Ages as a token of good luck, since it looks like it is made of all other gemstones. There is also "Common Opal" which is also referred to as "potch". It doesn't display flashes of color. Peruvian Opal, which comes in blues, pink, lavender, which, yellow, and mint, are examples of Common Opal. Fire Opal is also technically "common opal". 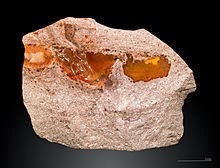 It is an opal without flashes of color, and is orange to deep red, and sometimes yellow-orange. Fire Opal is NOT a term to use when describing Precious Opal, even though Precious Opal displays colorful "fire". Fire Opal is only a term used for the orange "common" opal from Mexico and the US. Sometimes, more transparent Fire Opals are faceted. Black Opal is a term used for opal that has a dark body color, often black or dark gray. 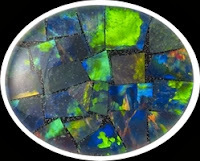 The term is also used for opal that has a dark blue or dark green body color. The dark body color often makes the fire of black opal more obvious. This contrast of fire color to body color makes black opals very desirable and expensive. Boulder Opal--In My Etsy Shop! Boulder Opal is a gemstone showing opal within its surrounding rock matrix. Opal often forms within voids or fractures in its host rock and specimens of boulder opal reveal this aspect of opal's origin. The contrast of color can be striking when a bright flash of opal is seen within a the surrounding rock material. Many people enjoy the natural appearance of boulder opal and find these gemstones to be beautiful, interesting and educational. Opals can also be "assembled stones", such as Opal Doublets or Opal Triplets. 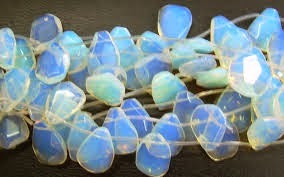 Whereas most opals are whole stones, some opal rough has very thin but brilliant fire layers. Artisans cut the stone down to the thin fire layer and glue it to a base of obsidian, potch (common opal) or basalt - then cut a finished stone. These two part stones are called "opal doublets". To protect the soft opal from abrasion and impact facturing, a crystal clear top of quartz, spinel or other transparent material is sometimes glued onto the opal. 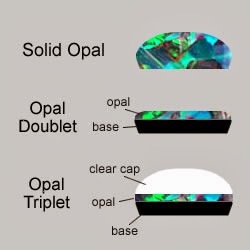 This produces a three part stone, called an "opal triplet". These assembled Opals offer beautiful and affordable Opals, that (when a triplet) provides stability to the otherwise fragile gem. Recently, "Opal Mosaics" or mosaic Opals can be found in the marketplace. These assembled gems consist of pieces of precious opal glued to a base (obsidian) and the covered with a "cap". This is a very affordable assembled Opal, costing a fraction of what a genuine precious opal, or even an opal triplet, would cost. Perfect for any Opal lover! 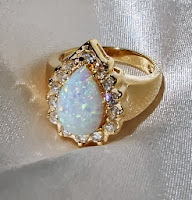 There are man-made simulated opals that have all the look of a real Precious Opal but are very affordable. 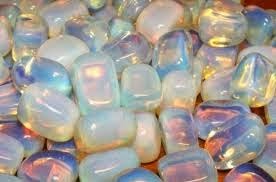 Some of these simulated opals are spectacular and really hard to tell that they're not genuine opals. They have beautiful fire that moves with the light, in a rainbow of colors. It's very hard to tell if an opal is simulated, so be sure to deal with a reputable seller who will disclose the true nature of the opal! Generally, simulated opals can have evenly distributed "sparkles" and have a "plastic" feel. Some people are claiming to have created "synthetic Opals" or so-called Gilson or Gibson Opals. This is controversial. A true "synthetic" or "created" gemstone is a gem that is grown in a lab that has the exact chemical and physical properties as the natural gemstone. It is, therefore, the gemstone---only created in a lab. Opals that are created in a lab do NOT possess the same physical properties----they don't have the water content that natural opals have. These so-called synthetic opals are made in labs in Japan, Russia, and other places I'm sure. These Gilson Opals are pricey.